Cacio e Pepe dressing? This is basically cheese and pepper - and in this case a few other ingredients - and it is delicious! This was Food and Wine magazine's salad of the month with fava beans and fresh peas. I didn't have fava beans and only had a bag of frozen peas (gasp!...frozen?...) but I imagine you could use most any spring vegetable you like and it will be great. This was the salad I served for the March dinner @Tate's. After collecting all the plates from the table husband came back and told me to not bother washing them because they were spotless! I hope you can try this soon. I am posting the recipe here as I made it the other night. The original recipe is in the April issue of Food and Wine. My daughter said "that's a mess of a salad mom?!" I guess it does look like that - but it was fantastic! Doesn't everyone always keep bags of frozen peas available? I do! Who has time to shell enough peas for a serving? No thank you! 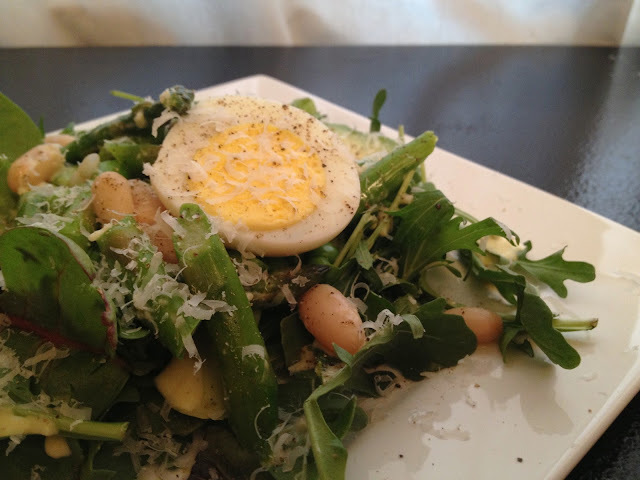 For this salad I used mixed herb greens and added a lot of arugula. Also added white kidney beans (rinsed first) and soft boiled eggs. Grated more Parmesan cheese on top and more fresh pepper then served. in a food processor, pulse the egg with the buttermilk and garlic until creamy. with the machine running - slowly drizzle in the olive oil until mixture is fully incorporated. add the cheese and several turns of fresh pepper. That's it. Your dressing is done. This will keep in the refrigerator for several days. But leave it on your counter top for 10 minutes or so before adding to your salad. Makes it easier to pour out. add salt then gently add the cut asparagus. cook 2 or 3 minutes. remove and run under cold water or immerse in an ice bath. back to the pot of boiling water - gently add the peas. remove and give cold water treatment. slice the avocado into thin planks. add a couple spoonfuls of the vegetables. sprinkle some of the beans all around. drizzle dressing all over the top of this mound of greenery. garnish with the egg, fresh pepper and more parmesan cheese. Delish! My plate was ~almost~ licked clean. 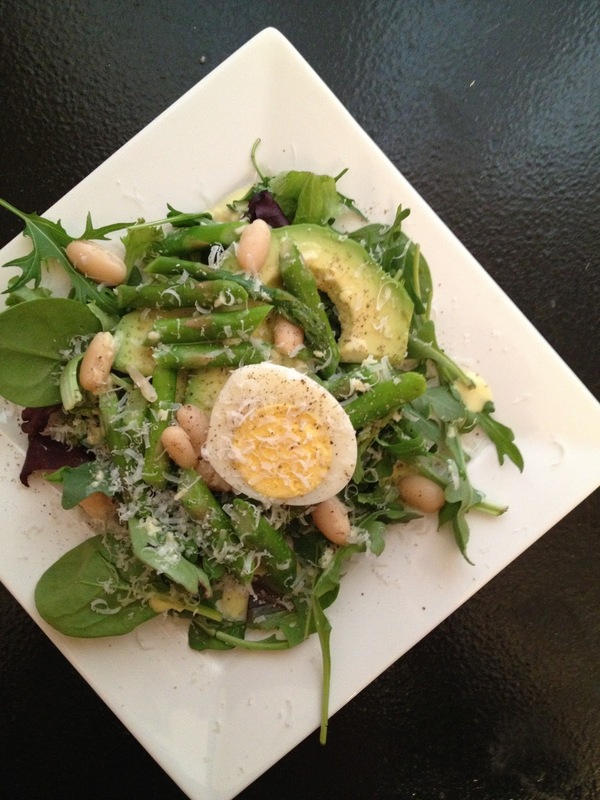 :) So enjoyed this salad, the entire meal, great company and fab cook/hosts.